Jamaica sprinter Usain Bolt has ended his six month relationship with a Slovakian fashion designer in order to focus on the upcoming Summer Olympics. News reports suggest Bolt's breakup with Lubica Slovak, 28, was because of his desire to repeat his double-gold/world-record Olympic performance in London. According to a source close to Bolt, He will have plenty of time for relationships and at the moment he's concentrating on his running career and doesn't want anything to distract from that." Lubica Slovak emigrated to Canada as a teenager and later moved to Jamaica after she took a vacation there. 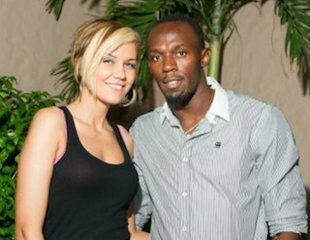 She was introduced to Usain Bolt by reggae singer Tami Chynn, a mutual friend. The sprinting star was criticized in his native Jamaica when a picture of him kissing Slovak, who is white, appeared in a local newspaper. A cartoon accompanied the photo, in which Bolt was seen running past a black woman with "local" written on her shirt and into the arms of a "Slovakian fashion designer." The island's second-largest newspaper published letters to the editor criticizing Bolt's choice in women. Countless Internet comments angrily reacted to the Bolt-Slovak relationship.